The Orville comes to the rescue of a Union colony under attack by a Krill vessel. Mercer’s tactical cleverness is able to outmaneuver the Krill’s superior firepower to win the battle and destroy the Krill ship. In the wreckage, the crew discovers an unscathed Krill shuttlecraft, which presents an opportunity for the Union: They can use the shuttle to send some operatives undercover as Krill crew members in an intelligence-gathering mission to learn about this mysterious enemy and their motives. Specifically, the assignment is to retrieve a copy of the holy book that guides the Krill’s deeply held religious beliefs, in the hopes that we might learn what drives their society. Mercer and Malloy take on this task — for which they are not particularly well equipped. 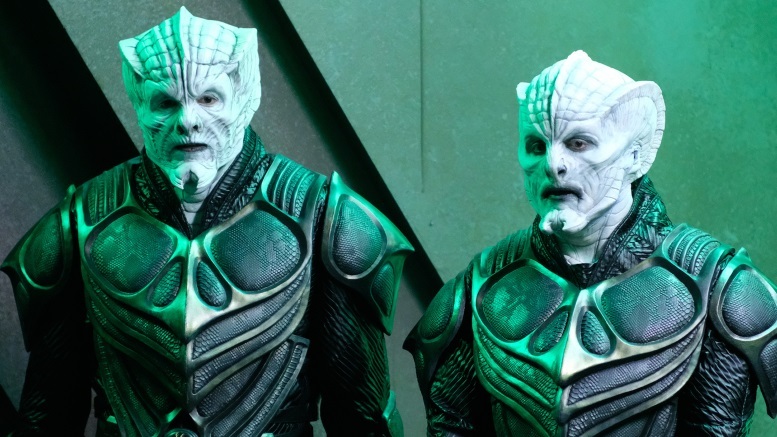 "Krill" is the best episode of The Orville yet. It’s the first episode that from start to finish feels like it’s living in its own skin and starting to build its own universe, rather than reassembling pilfered pieces from here and there. Sure, the plot (undercover characters pose as the enemy) is another take on a reliable standby, but that’s perfectly fine. I have no problem with new takes on reliable devices if the writers can bring a sense of energy or specificity. This is an entertaining, well-paced, breezy hour that works on the lightweight terms where this series lives.